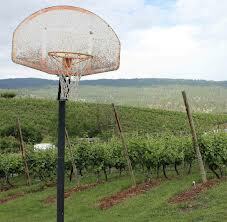 I was 1 for 4 in my Thursday games using wine as the determining factor in predicting winners in the Sweet Sixteen. Let’s see how the analysis fairs for tonight’s games. Iowa St vs. Connecticut. This is a tough one. I have been to wineries in CT and liked them. I stop at wineries anywhere I can. I am interested in their efforts to produce something locally. But at one winery I visited, loaded with casino folks needing a break from losing, I asked, “can I have a wine you make here?” I was told, we make all our wines here as I looked down the list of a dozen wines, seeing a grape that in no way can grow in the northeast. So I re-phrased my question and asked for something made with their own grapes. I was given a choice of two (two they were out of). They were very good, but ask specifically. CT is the only New England state with more than one AVA (they have two) and there are over 30 wineries there. By the way, the East Regional is at the Mecca of Basketball (that is a general basketball reference, not a Knicks specific reference), the World’s Most Famous Indoor Sports Arena –Madison Square Garden. It is however not a Mecca of Wine Meets Basketball because when I was there most recently, the choice of wine at the food stand was Woodbridge cabernet is a small plastic bottle. Iowa had five vineyards in 2000. Today they have 310, and the state ranks 14th in number of wineries. Because of the climate the focus is largely on native American and French hybrid grape varieties. Here is one thing I think is very cool about the wine scene in Iowa (and other Midwest states)…a number of wineries are being started by farmers who believe growing grapes is a better economic and environmental decision than growing corn and soy. Good for them. Advantage: Iowa St.
Virginia vs. Michigan State. Michigan is a large producer of wine, with over 120 wineries and four AVAs. Initially, much of it was sweet wine as Concord grapes were widely planted after Prohibition by the Welch Grape Company. The state is also a major producer of cherries, and by extension, cherry wine. Wine-related tourism is an over $100 million industry in the state and they hope to be producing ten times more wine in the next ten years than it does now, but vinifera grapes are a challenge because of the weather. The industry in Michigan is supported by an agricultural research program at Michigan State University, which began experimental vineyards around the state in 1970 and established a winery on campus in 1972. Are there good wines being made in Michigan? Ive seen them on wine lists at Danny Meyer restaurants, so what do you think? Kentucky vs. Louisville. Although known for bourbon, Kentucky is the sight of the first commercial winery in the United States. The Marquis de Lafayette’s winemaker, Jean Jacques Dufour, looked for land to grow grapes, and settled near Lexington, the “Athens of the West”. Dufour, with the help of backing from a group that included Henry Clay, made his first wines by 1803 at what he called “The First Vineyard”. At one time, Kentucky produced over half the grapes and wine in the United States, and by the late 1800s, was still ranked third in the country. Then with Prohibition approaching, many turned to tobacco. Today, there are over sixty wineries, and since the 1980s, many tobacco farms have switched to grape production…”Cigs to Swigs” is not the motto however. There you have it, another unscientific, somewhat historical Sweet Sixteen analysis. Here’s hoping the games and the wine you open this weekend are all at least good and approaching memorable.